In week 12, when the Duke of York crossed the Equator, Captain Morgan did not permit a crossing the line ceremony to be held onboard. It was a different story for those onboard the Rapid, crossing the Equator on Wednesday 8th July. The “usual absurd ceremony” was held onboard to initiate the ‘uninitiated’ passengers who had never crossed the Equator before. Little detail is given in Dr John Woodforde’s diary, and we can only imagine what events occurred. These ceremonies are thought to have originated long ago and up until the 19th century were often a brutal event. Ships crossing the Equator today still hold ceremonies to mark the occasion. • What is a ‘crossing the line’ ceremony and how did it originate? • Who takes part in these ceremonies and who is exempt from participating? • Do all ships hold celebrations when crossing the Equator? • How have these ceremonies changed over time? What causes these changes to occur? • King Neptune and his court officiate the crossing the line ceremony. The role of King Neptune is usually played by the oldest person onboard who has crossed the Equator before. Research the other roles in a traditional crossing the line ceremony and the origins behind these. • In his diary entry, Dr John Woodforde states that he was exempt from participating in the crossing the line ceremony. Discuss the reasons why a person would be exempt from this event. • What was the significance of this event and what would crossing the Equator have meant to the passengers? • Who is King Neptune and why is he considered an important figure in this ceremony? What other beliefs and customs are associated with King Neptune? Chronology, terms and concepts: • What imaginary lines are used to segregate areas on a map? • What do the terms latitude and longitude refer to? • Reference and locate the following: Arctic Circle, Antarctic Circle, Equator, Prime Meridian, Tropic of Cancer and Tropic of Capricorn. • From which Latin word does the word 'Equator' originate? Historical questions and research: • Research the equatorial climate. Work out the average temperature along the equator? Graph the average temperatures for a specific location over a 2 year period. What conclusions can you draw from your results? Analysis and use of sources: • Locate the Equator on a variety of world map projections, including globes, those in an atlas and online maps. Perspectives and interpretations: • There is a lot of information about how those onboard Navy vessels are initiated today. Do you think these current practices are a bit of fun, or are they demoralising for those who are subject to these events? • During these ceremonies, many ships would give an ‘offering to the sea.’ What do you think this is meant by this? • Write King Neptune’s speech for a crossing the line ceremony. • Select a location near the Equator. Develop a travel brochure to entice visitors to this place. Which time of the year do you think would be the most popular for tourists and why? 1. The Equator is an imaginary line used to segregate the northern and southern hemispheres. Use an interactive whiteboard and the Oxfam website to locate countries on a world map and develop an understanding of locations in different hemispheres. 2. In crossing the line ceremonies, passengers dress up in costumes and role play characters to initiate others. Imagine crossing the Equator onboard a vessel, and in a small group, script and perform your own crossing the line ceremony. Think about the significance of characters and their relationship to the sea. 3. Over time customs have evolved and a tradition has developed where people who have participated in a crossing the line ceremony are given a keepsake. These keepsakes are a reminder of the special occasion and are also proof that the recipient is tough enough to endure the hardships and hazards of life at sea. 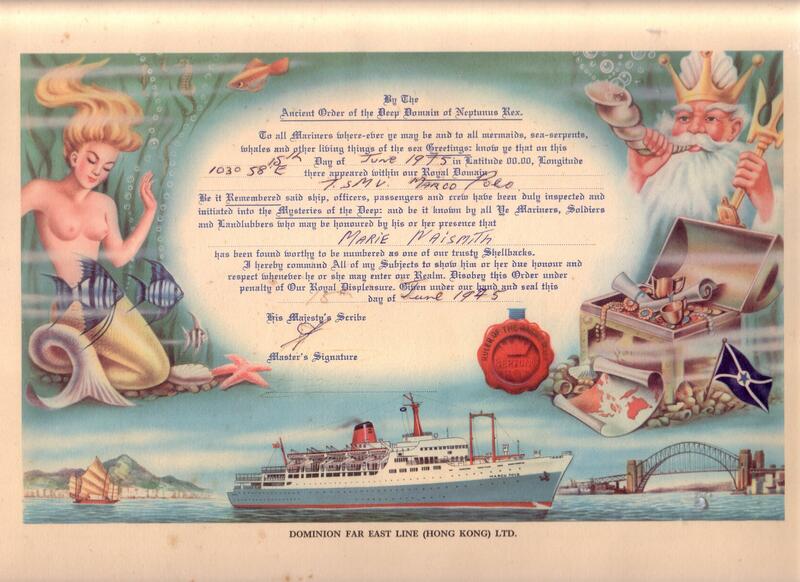 Nowadays passengers are given certificates as a reminder of their Equator crossing. Look at examples of crossing the line certificates and develop your own. Be prepared to give reasons for your design and content. 4. The Equator passes through 13 countries: Colombia, Ecuador, Brazil, Sao Tome and Principe, Gabon, Congo, the Democratic Republic of the Congo, Uganda, Kenya, Somalia, Maldives, Indonesia, and Kiribati. Locate these countries on a world map. Select one of these and research the traditional customs and ceremonies held in your chosen country. How are these celebrations the same or different to those celebrated by your family? 5. Did you know that that the rainforests along the equator are unique habitats that are home to more than half of the world's plant and animal species? Create your own rainforest habitat in your classroom. Include the different environments, from your floor to the ceiling. What animal and plant species are found in the canopy, understory and forest floor? This task can also be applied to exploring the diverse ocean habitats of the world. Someone refused to take part in the ‘crossing the line’ ceremony. What attributes does this person display and how can someone’s opinion affect the way others treat them? All passengers should take part in the ‘crossing the line’ ceremony because it is a tradition. Next week we learn about how the weather and sailing conditions are fairing. How did wind affect the journey in 1836 and how have advances in technology enabled us to use wind today?